1) The stage frighter: This individual gets extreme stage fright when taking a wiz. So, when you’re already in the stall, your closed door alerts them to your position. Since they know they aren’t alone, they stand in stale mate for several painfully awkward seconds. Meanwhile, you’re in the stall delaying your proceedings until they get things going. Stage frighters steal your time, and they raise stress levels to yellow. 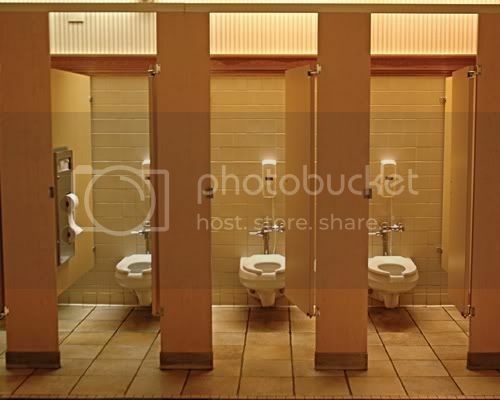 2) The shameless: The shameless only arise in bathrooms that have more than one stall. This individual comes in after you’ve already taken the first stall, and absolutely blasts off right next to you. If this was your friend, it would be funny. But since it’s a co-worker, your only choice is to sit in silence and listen to their fireworks. 3) The lingerer: When you’re in a stall, you don’t want your co-worker to know your identity (nobody wants the stigma of being a work pooper). So when somebody else is in the bathroom, you wait for them to leave before you emerge from the stall. Lingerers like to hang out for prolonged periods of time, doing God knows what. Meanwhile, you’re just hanging out waiting for their departure. 4) The chatter: This is without a doubt the worst of all the violators. These are co-workers that actually try to start a blind conversation while you’re in the stall. Most chatters are old, so I’m thinking that in the “good ol’ days” people had long fulfilling conversations while taking a dump. But it’s 2011, and I’m a firm believer in silence while on the can. Now, if you’re both washing your hands at the same time, this is an acceptable time to make small talk. But if either party is in mid deuce, keep your mouth shut. 5) The faker: The faker isn’t so much a violator, but a hilarious side effect of corporate bathrooms. A faker enters the bathroom looking for a stall, but when the stall is full, they immediately move to the sink to wash their hands. Keep in mind, neither party sees the other, but the faker still feels the need to give a reason for their entry into the bathroom. Fakers are always good for a chuckle. 6) The non-hand washer: These violators are baffling. They’re typically the first to reach the bathroom, but once you’re inside you clearly see a co-worker use the facilities and exit without washing their hands. These violators don’t shock me outside of the office because odds are you’ll never see that person again. But in an office, you see these people every day! Do you really want that stigma? But it happens far too often. 7) The sawed off shotgun: Ladies, I can’t speak for what happens in your restroom. But there are men who simply cannot hit a target. A true sawed off shotgun are horribly inaccurate, and refuse to take care of their mess. Once again, in public, this doesn’t shock me. But at work, we don’t have another bathroom option, and they’re clearly making life difficult for the people you work with. These men need learn how to point at the giant pink urinal block, keep focus, and hit that sucker. Walking through wiz trails is disgusting. Let me make one thing very clear, I don’t have even the faintest fear of public restrooms. However, I am easily annoyed with corporate culture, and I despise every classified violator (except the faker, they’re just hilarious). This is primary reason I’d like to start my own company, and hire only people I’m friends with. Not only would we have a great time at work, but we would make rules for the bathroom. And, if one of us broke those rules, we would call them out. Calling people out when you’re a mid-level employee just isn’t an option. However, if your buddy tries to chat it up while we’re on the can, you can slap him/her right in his/her stupid head. After we wash our hands like civilized human beings of course. A chatter would deserve a slap, but they certainly don’t deserve poop hands. This article is amazing and exactly right! I won't readily admit which one I am classified under but I think its safe to say I've been every one of the 7 at one point.